Great Escape 2018 Interview: ONR. It’s good to be Shields at this very moment. Things with ONR. have moved rapidly, and even Shields himself acknowledges the flight path for him and his band has been highly unusual. “It was so bizarre because I was literally signed off the back of a couple of demos. It was the weirdest thing. There was no live show at that point, no production, no nothing. I hadn’t played a show, I didn’t have a Facebook page, it was so embryonic. Everyone really believed in these two tracks. It just went from there. How Shields describes it explains well why, at least over the last year, there’s been a minimalistic approach with ONR.’s social media channels. Everything has been monochrome. As mentioned in this SXSW 2018 Bands to Watch piece, his face wasn’t even revealed until this past February. “For us, we wanted to keep it small to begin with and very Joy Division-like, nondescript and mysterious. So hopefully, when the bigger songs start to come out and the bigger production start to evolve, then that look will evolve with it as well, and you’ll start to see colour behind it. That’s the idea, at least. I’m a big fan of the image of everything matching an artist’s evolution.” It’s a fascinating idea and something to look forward to. Hearing the irrepressible, electronic bombast of the ONR. songs released so far – including first single ‘Jericho’, ‘Five Years Time’ and the more recent ‘American Gods’ – it comes as a major surprise that electronic was not Shields’ favoured genre until relatively recently. “It’s odd, because I’m a keys player. It’s like my thing. I’ve always used synthesisers and been into them. But I think almost because of that, I rebelled against myself for a while and got into ‘New New Wave’, like Interpol and that kind of stuff. So I came back to electronica through David Bowie’s ‘Scary Monsters’ and Gary Numan.” Bowie, he says, is his biggest musical influence, with quite the legacy to look up to. One of the most daunting things for an electronic act to sort out is making sure the live show provides the kind of experience worthy of the music on record. Given that I felt their live performance this evening was even more powerful than the songs as they are presented and available now on streaming services, I wanted to know his philosophy towards delivering a live experience. “I like of the idea of it [of ONR.’s sound as] as being as big as a rock band. That’s the kind of upwards scale that I want to be able to have, and that totally works for that [gigs]. With the production and the recordings, you have more freedom to ebb and flow there. For a half-hour set, you really want to go in and hit people between the eyes. We’re still building it, and that will evolve again and again, and we’ll never stop evolving.” The massive stage at the Paginini Ballroom allowed for Shields as frontman to roam across its wide expanse and play to the audience, and you could tell he was massively enjoying himself the entire time. What’s eminently clear is Shields’ eye on the prize and his willingness to work hard to get where every musician dreams of. “I have no lack of ambition, I totally want to push it as far as I can. I’ve been doing this for a while. I feel like I’ve served the apprenticeship, I’m ready to go. It feels good.” We here at TGTF are right behind him. Robert Shields and ONR. begin their string of North American appearances tomorrow night, the 8th of June, with a headline show at San Francisco PopScene. The next ONR. single ‘Love in Suburbia’ will be out on the 15th of June, the same day they’ll be in Washington, DC at DC9 (yes!). As mentioned in a few of my roundups from The Great Escape 2018, nearly all the afternoon showcases I attended were rammed. This included Sound Australia’s takeover of both the downstairs main room and the upstairs Studio Bar spaces at Komedia on Gardner Street. Like a dolt, I forgot, again, that we had to enter through the back entrance of the building to get to the live performances. In case you haven’t been able to enjoy a past Sound Gallery event at SXSW, The Great Escape or at another event, let me explain to you the general premise. The acts who perform are generally on the lighter, more acoustic side of things than hard rock or electronic. Attendance was high at both stages of Sound Gallery by the time I arrived, but I was lucky enough to be present for most of Hollow Coves’ set upstairs, sneaking around people and making it to second row from down the front. What I’ve branded as their style of music, ‘ethereal rock’, easily mesmerised the assembled crowd, the duo’s harmonies sounding gorgeous, even angelic. Hailing from Brisbane and The Gold Coast, the sea is important to them, so it’s not surprising they’ve written a gorgeous number called ‘Coastline’, which you can enjoy in an acoustic form below. It’s still really early days for Hollow Coves. But judging from the rapturous reception they received at their first performance at The Great Escape 2018, the future looks as bright for Henderson and Carins, just as the sunlight gleams and smiles upon on the Northeast of Australia. I wish them the best. My first interview at SXSW 2018 was with English singer/songwriter Allman Brown, who I met before his very first SXSW showcase on the Tuesday night of the music festival, at Austin’s Seven Grand. We had already featured Brown as one of our Bands to Watch leading into SXSW, and he kindly answered our Quickfire Questions ahead of the festival, but this interview was a nice chance to chat with Brown one-on-one, and to get quick preview of what I was about to hear from him on stage. The background music and chatter at the Seven Grand got gradually louder as the start time for the evening’s showcase approached, and I took that cue to ask Brown about his set list for the show. “It will be a bit of a selection really, because it’s just me,” he confided. “I don’t have the band, which I quite like sometimes, because it’s good to sort of keep your chops. I spent years just playing by myself. So, a couple of new songs, and some old favourites from the album. I mean, they’re my old favourites,” he laughed. Following his Tuesday night show, Brown played a handful more shows during his time in Austin, including a second official showcase at the Barracuda on the Saturday night and a potential Sofar Sounds show, which was yet to be confirmed at the time of the interview. I haven’t yet found any evidence of that show online, but Brown is a Sofar Sounds veteran, having performed shows in London, New York, and Paris in the past. Just below, you can watch a vintage clip of his 2012 NYC performance, courtesy of Sofar Sounds. Brown did a brief tour of North America at the start of May, following on the success of his SXSW appearance, and played a short string of shows in the UK at the end of the month. His new EP ‘Bury My Heart’ is available now. Part 1 of this interview feature with the fabulous Rachel K Collier is through here. The Welsh artist is also eager to lift the veil over what is all too often a black box for electronic music fans. “In the future, we’d like to get cameras on the Push, so people can really see what I’m doing. No one can see the lights on the Push and what I can see.” I point out that as a female producer, songwriter and performer, she’s an all too rare breed these days. The very existence of Rachel K Collier and the success she has garnered so far can only be a positive thing for the future of electronic music, I explain. Having someone like her out front, showing a woman can make it in the electronic genre and have fun doing it is a huge thing. “I’ve had a few things [like that] happen. With my first self-release, I did it on Love & Other, a really small label. [That EP, ‘Words You Never Heard’, got a review of 8/10 on Mixmag. Not bad at all straight out of the gate – Ed.] That was really cool, a nice starter. I look back at that stuff and go, gosh, that’s really basic. Then my first-ever self release on AWAL, I got a comment, ‘great track! Whoever produced this for Rachel should do a whole album with her.’ I said to Ben, email them now, tell them I bloody produced it! Get that message through. Some people just don’t connect girl and a bass line. Girl and drums. Girl and computer. There’s a girl called Nightwave, she’s a female DJ, she did a Boiler Room and people totally slated her [read more about that incident here]. She’s now set up this whole thing [with other UK female electronic producers] called Producergirls. She does her lecture with quotes like ‘Who did she do to get there?’ and ‘Oh, she must have a ghost producer’, all this crap boys say. She’s very excited for the work coming up for the rest of the year. “I’m going to be producing my album now, and then I’ll be making an Ableton video for my single ‘Darkshade’ that was released today.” Although Collier is based in Wales, she’s very cognisant of staying in the public consciousness in territories beyond where she’s from. “We’ve learnt we need to keep building our presence here in the States.“ Sounds like us Americans might be seeing much more of Rachel K Collier in the coming months. Fingers crossed! Massive thanks, Rachel, for taking the time for this interview. 2017 proved to be a pivotal year for Collier, the live artist. “Last year was a really awesome year because I did my first UK tour. Last year was my transition from making the YouTube videos to the stage. It happened [all] very fast. I was doing my YouTube video, and then I was doing my first college performance and I was opening different Projects, different songs. Then I had another show and thought, okay, I need to do three songs, and they need to be in the same project.” Soon enough, she found herself needing to take her music up a major notch. “By July, I was playing in the Czech Republic at Beats for Love Festival. I had to do an hour set. So it was like, right, okay, now I need to have songs. It took a year to take the live show and refine it, refine it, refine it, refine it. Since taking that chance to find Ableton staff at ADE 2016, she’s “really bonded” with not only with the London Ableton team but with the team at Ableton HQ in Berlin, who asked her to front their Ableton Live 10 global campaign. “It was so cool, because it was the first time ever [for an Ableton release], as a female producer, ‘would you come over and produce, and make a track for our Live 10 release?’ It’s not, ‘go and do the top-line because you’re a girl and you sing’, it’s ‘go and produce the music’. I was like, hell yeah! I flew out to Berlin a couple of times and got to go to Ableton HQ, use Ableton 10, use the new plugins, Pedal, the Echo, the Groups Within Groups. I was meant to be second on the video because my BPM was around 130, and the structure of the video was such that they were going to showcase this tempo, and then this tempo, and then this tempo. Enjoyed this? Stay tuned for part 2 of my interview with Rachel K Collier, which will post here tomorrow. To read the first half of my interview feature with frontman David of The Wedding Present, come through. In describing the festival, like much of this interview with him, what comes across from Gedge is a genuine warmth and excitement, and a desire to contribute to the business in a positive way, his way. So it’s no surprise he’d want to take on the hard work of having their own label, Scorpitones, which has released nearly all of The Wedding Present’s records since 2005. “Having the final say over matters concerning our releases – artistic and commercial decisions, etc. – has always been paramount within The Wedding Present and, when you have your own label, you have total control over absolutely everything. That’s the most rewarding thing. I’m not answerable to anyone.” And ultimately, that’s what all artists wish for, isn’t it? I have a final question for Gedge. After having accomplished so much in the over 3 decades, what does he wants to be remembered for? Without hesitation, it’s “My comic book! Tales From The Wedding Present.” It may sound like an unusual response, to not have named an album or a song. But on second thought, it makes total sense. 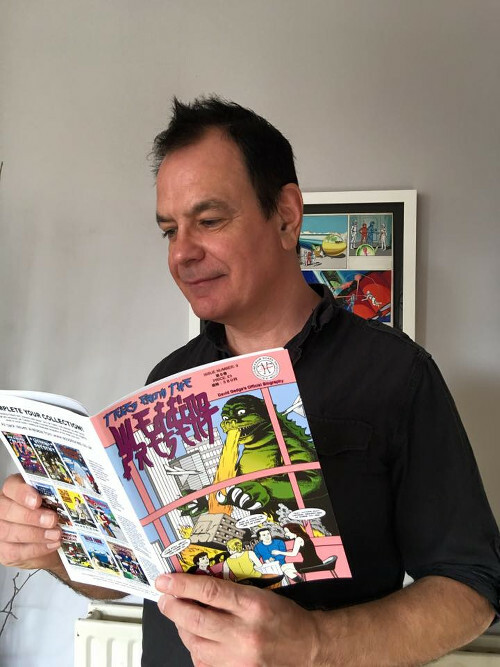 While the songs and albums are Gedge’s bread and butter, putting himself and the band’s life on the road into a serialised comic series and indulging in his personal passion for the art form is David Gedge being David Gedge. And we wouldn’t want him to be anybody else. Many thanks to David for being such a cool dude and answering so many of my burning questions!